The Jardin de I'Eveche in Castres has been designed in about 1664 by Andre Le Notre, the gardener of King Louis XIV. 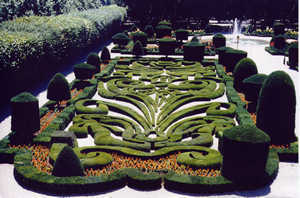 The four quarter flowerbed consists of box tree arabesques, florets, networks, trefoils crowned with palms and volutes. The box external borders are heightened with trimmed yews of various shapes. Guided tours with Tourism Office by appointment.